This piece was originally written for Building Design, published in June this year. In 1958 Mies van der Rohe completed one of the most influential buildings of all time. The Seagram Building on Park Avenue was his first tall office building and it is undoubtedly a masterpiece. His boldest move was, as Adelyn Perez writes admiringly in the Arch Daily Classics Series, ‘the grand gesture of setting back the building 100 feet from the street edge, which created a highly active open plaza… with its two large fountains surrounded by generous outdoor seating’. Perez praises Mies’s radical move to ‘distance himself from New York’s urban morphology of lot line development, and the conventional economics of skyscraper construction’. So impressed were the New York Authorities that in 1961 they rewrote the city’s zoning ordinances allowing skyscrapers to go taller if part of the site was set aside for a similarly lively public plaza. Except of course the plaza is not lively – try googling images of the Seagram Plaza, they are pretty much all devoid of people, it creates a dead zone on the otherwise vibrant Park Avenue, a point that was being made by William H Whyte in his studies of public space as early as the mid 1960s. The Seagram Building is inspired architecture but terrible urbanism. Over that time the Academy has had a sometimes difficult relationship with the Architect profession. High profile architects like Piers Gough were members in the early days but resigned over concerns that the academy was only interested in safe established places and traditional architecture. These arguments have a long history in the profession with ‘Internationalists’ setting themselves against ‘Regionalists’, Modernists against Post-Modernists. The Academy of Urbanism had been branded, by some, as regionalist and traditional. This is generally considered not to be on the side of the angels in the eyes of most architects and indeed the architecture press (the same has happened with the Congress for New Urbanism in the US). As the new Chair of the Academy of Urbanism I am keen to widen this debate. Urbanism is not a stylistic choice, it is neither traditional or modernist, international or regionalist. Urbanism is the study of how cities work. In the Academy’s new book we liken urbanism to horticulture. A garden designer or a landscape architect with a poor understanding of horticulture will make mistakes. In a similar way architects and urban designers who don’t understand urbanism can often get things terribly wrong. And yet, like horticulture, the way in which urbanism influences architecture is intuitive and creative. Like a good gardener an architect who understand urbanism will work with it and test its limits rather than seeing it as a set of constraining rules to be challenged (as Mies did in New York). So yes it is true that the 75 places in the new Academy book do include some traditional, historic places (particularly in the towns chapter). However it also includes great European cities, streets, neighbourhoods and places, many of which are contemporary. What unites them all is good urbanism by which we mean places that are safe and lively, which contain a mix of uses and people, which have strong economies and encourage sustainable ways of living. They cover everything from the dense centres of great cities to lower density suburbs and small towns. Each of them is a very human story about how the alchemy of urban life, economics and built form has been mixed to create great places. Many of these stories include great architecture although is only part of what creates good urbanism. But there is no reason why we cant have both inspired architecture and good urbanism – if only the architect and the urbanist can be reconciled. Categories: Academy of Urbanism | Tags: Academy of Urbanism, Urbanism | Permalink. In 2010 Glasgow was one of the three cities shortlisted by the Academy of Urbanism for its Great City Award and indeed was eventually voted as the winner. This is the report of the assessment visit to the city. A number of the people that we spoke to when the Academy visited Glasgow started their presentations with an infamous front cover from the Observer Magazine in the 1980s. Over a picture of urban devastation ran the headline ‘Home Rotten Home, what its like to live in the worst corner of Britian’, by which, of course, they meant Glasgow. This was the city’s nadir and in hindsight also its turning point. It is difficult to believe that this is the same city described last year by Conde Nast as a ‘a fantastic world class city’ by the OECD as the ‘the New Berlin’ or even more improbably by Vogue as ‘the chicest city in the world’. However once you spend some time in Glasgow, walking around the city centre – it’s stylish shops, new financial district and creative Merchant Quarter – and travel around the environs of Kelvingrove, the redeveloped Clyde Waterfront and the new urban quarter of Crown Street the hyperbole is not so far fetched. In the words of Time Magazine; ‘brimming with style and culture, Scotland’s second city is a revelation’. Glasgow is a city transformed and it is almost impossible to imagine it, as it was when it had an unemployment rate of 60% and was described as a ‘Hellish mix of drink poverty and violence’. Well almost impossible. On visiting the city’s East End and hearing about districts like Carlton where male life expectancy is just 53.9 years (compared to 67.4 years in Iraq as the Sun Newspaper helpfully pointed out) you realise that the Glasgow of old has not been entirely banished despite huge efforts and investment by the council and other agencies. Glasgow’s transformation may not be complete but the extent of its renaissance is pretty impressive. No other city has recovered so well having fallen so far, and it holds lessons for the reinvention of industrial cities across the western world. However as we heard, Glasgow’s origins are not, in fact, as an industrial city. It started as a religious centre founded on the rather dubious myth and relics of St. Mungo. The cathedral is the oldest in Scotland and the University is the fourth oldest in the UK (after Oxford, Cambridge and St. Andrews). It later developed as a trading centre on the Clyde, built on the back of slaves in the cotton and tobacco trades. Such was its wealth and growth rate in the early 19th century that a new town was build to the west of the cramped medieval city centre. This extension was gridded like a North American city, heedless of the site’s topography, and one of the presentations described it as Chicago on the Clyde, the most easterly American city. There was in fact an lively interchange between Glasgow and the US, with Glasgow architects helping to shape the architectural character of cities like Chicago and then reimporting the American influence to Scotland. So successful was the new town that the city centre shifted westwards. Today Trongate once the western entrance to the old city now marks the eastern boundary of the city centre. By the beginning of the 20th century Glasgow’s population had grown to more than a million and the city was designing and building half of all the iron-built, sea-going ships on the world’s oceans. It was one of the preeminent industrial cities of Empire – one of the ‘shock’ cities of the age doubling and trebling in size as it sucked in people from the highlands and Ireland. At its peak it was a city of great contrasts – able to stage the 1903 International Exhibition and commission world-class architecture like Gilbert Scott’s University Building and Macintosh’s School of Art, yet with some of the most notorious slums in Europe. It was from these heady heights that Glasgow fell. In the latter half of the 20th century its industrial base collapsed, its population halved and it became the ‘Home rotten home’ described by the Observer. Its route back from the brink has been an object lesson in city regeneration. This stated in the 1980s with the establishment of the Tourist Board and the opening of the Burrell Collection along with the 1988 Garden Festival. However the big breakthrough was its designation in 1990 as European City of Culture which Glasgow used very skilfully to relaunch itself. The two decades since then has seen the physical transformation of much of the city. The city centre has been regenerated and we were told that it is now the largest retail centre outside London. 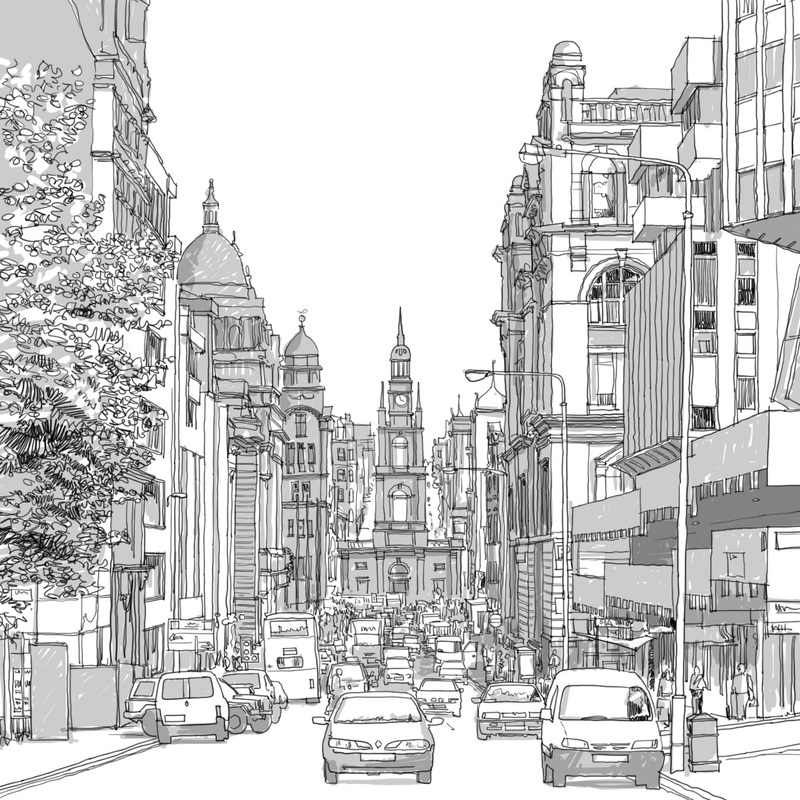 The Merchant City has been revived as a cultural quarter, the Universities are expanding and being restructured to create a new learning quarter, while the city centre has expanded towards the river with the new International Financial Services District. To the west the former ship yards on the Clyde house the Scottish Exhibition and Conference Centre (the Armadillo) together with the new Digital Media Village and the HQ buildings for the BBC and Scottish Media Group. To the East the Clyde Gateway project is being managed by an Urban Regeneration Company that is using the 2014 Commonweath Games to kickstart a £2 Billion regeneration programme starting with a Games Village of 700 units and four new venues. Across the city 21,000 social housing units are being redeveloped and neighbourhoods like Crown Street (the former Gorbals) are being used as model to regenerate neighbourhoods around the city. The results are impressive. In the decade to 2007 the city’s economy grew by 20% creating 63,000 jobs and attracting 45,000 new residents. The city’s confidence is reflected in its carefully managed image – ‘Scotland with Style’ and its momentum has carried it through the early years of the recession. In 2009 there was a £3.95 Billion investment programme underway. Some of the plans, especially in the East End seem ambitious in the current economic climate but even here the city is fortunate to have the Commonwealth Games as a focus for investment to see it through the worst days of public sector cutbacks. Today Glasgow really does have a certain style and huge self-confidence. In the UK we are not always very good at recognising that we have our own great cities that can match Milan, Barcelona, Copenhagen and Chicago. Glasgow may not quite be at the level of these cities, but walking around on a warm evening at the end of Summer on the Academy visit it really did feel like somewhere special. The red sandstone buildings, the granite paving and warm glow of the shops and bars felt a little like Stockholm or Copenhagen. Considering the state of Glasgow less than 30 years ago the it is remarkable we can even make these comparison. Categories: Academy of Urbanism | Tags: Academy of Urbanism, Cities, Urbanism | Permalink. This piece was written as an assessment report for the Academy of Urbanism Awards in September 2012. Can a building be a great place, at least in the way that urbanists would understand it? Urban places are generally to be found in-between buildings rather than within a single building. They are places where people can linger, that are animated by the life of the buildings that surround them and where the theatre of public life is acted out. In short they are part of the public realm. Yet by all of these tests Kings Place is, as its name suggests, a ‘place’. Its atrium is open to everyone to come in, and sit, and meet without needing an appointment or having to buy a coffee. It is a space animated by the 3,000 people who work in the building and the many thousands more who come to a concert or visit a gallery, drink in its bars or eat in its restaurants. Like Nolli’s map of Rome, which showed the inside of public buildings as public spaces with the same status as the neighbouring streets and squares, Kings Place has created a great indoors urban place. Kings Place was conceived by the Leeds based property developer Peter Millican. He reasoned that, as office users demanded larger and larger floor plates, more of the city was being privatised. He therefore conceived on an office scheme that was also a public space. 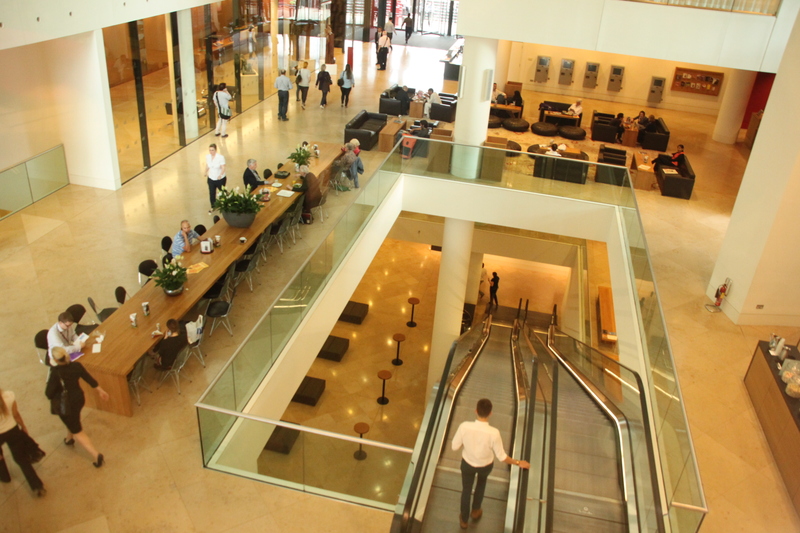 Kings Place includes 500,000 square feet of space, of which 300,000 square feet is lettable (a terrible gross to net ratio as many agents and developers have remarked). Yet the common areas are anything but common. The entrance gives onto a huge atrium the height of the building that links the street to the canal basin at the rear of the building. At the entrance is a sculpture gallery and the atrium includes a coffee shop, conference space and a bar and restaurant at the rear with a terrace alongside the canal. Above this are offices, the main tenant being Guardian Newspapers who occupy three floors and have their own entrance. However it is what lies below that is the marvel. The building is sunk deep into the ground with three basements the upper two providing the main public facilities. The atrium opens up into a wide staircase dropping down to two levels of gallery space and a range of cultural facilities. These include three halls, a studio space capable of seating 220 a traditional concert hall with 420 fixed seats and the St Pancras Room, an auditorium for speech, seating 100. There are also three rehearsal spaces, recording and broadcasting facilities, dressing rooms, a teaching room and office space for the London Sinfonietta and the Orchestra of the Age of Enlightenment, plus a range of smaller music organisations. This has all been bequeathed to a charitable music foundation that programmes the space. All this in a building that opened in 2008, just as the world was consumed by the credit crunch. As we were told on the visit, Peter Millican was either really cleaver or very stupid. Indeed during the visit the academicians spent a long time trying to understand whether Kings Place really had discovered an alternative reality for property development, as some commentators have argued, or whether the scheme is in fact an extraordinary piece of philanthropy. The story starts in the early 2000 when Peter started looking for a site in London to build his concept of an office development for the future. He set himself a number of goals; to build a strong team of people, to build well, to build generously and to build on a transport hub. The building was to bring together three Cs: Commerce, Culture and Community. The site on York Way was very off pitch at this time, before the decision to locate the Eurostar Terminal at St. Pancras and prior to the planning approval of the Kings Cross masterplan. The benefit of this was that the land – a former depot employing 30 people – was cheap, the problems were the prostitutes on the street, the planning authorities reluctance to allow such a large building and everyone’s difficulty in seeing it as an office location. However the scheme proceeded, Dixon Jones was appointed as the architect following a competition and the concept took shape. The key moment was securing Guardian Newspapers as an anchor tenant. They had been looking for an alternative to their cramped premises in nearby Farringdon and were attracted by the concept for the building and the fact that since it was still at the design stage they could design their offices. Other prelets followed including Network Rail and Logica with the result that the building was fully let on the day it opened. Other property developers may regard the building as being hopelessly uneconomic, but it is impossible to separate the generosity of its concept from the fact that it has been fully let and profitable since it opened. As Peter Millican points out, they were able to get finance for 80% of the value, something which would be inconceivable today and which would make the model impossible to replicate. On the visit we came to the conclusion that cities would be much better places if all offices were built this way, but that this was probably unrealistic. We were not however clear whether this made Kings Place less important as a replicable model or more impressive for the achievement of it being built. In 1996 a boat arrived in Sowerby Bridge that had travelled over from Manchester on the newly reopened Rochdale Canal. 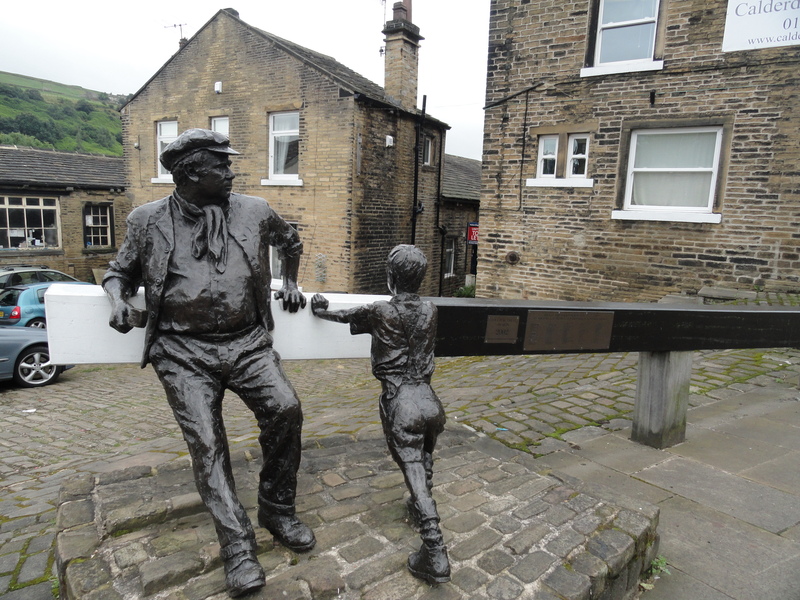 In the same year the Sowerby Bridge Wharf Partnership was formed bringing together local businesses and leaseholders, English Heritage, The Civic Trust and Yorkshire Forward coordinated by the Prince’s regeneration Trust. This was the culmination of a campaign dating back to the mid 1970s to highlight the importance and the potential of Sowerby Bridge Wharf. The restoration of the Rochdale Canal had been achieved by stealth, through a series of environmental improvements that had restored sections of the canal even when the reopening of the whole seemed impossible. Meanwhile a campaign had been fought in Sowerby Bridge to prevent the canal basin being filled in for use as a car park. 1996 may have been the end of these long campaigns, but it was also the start of a process that would see the refurbishment of the wharf and its development as a place for leisure and business. The first canal boat had arrived in Sowerby Bridge in 1759. The extraordinary thing about this date is that – as children across the UK are taught through the National Curriculum – the world’s first industrial canal, built by the Duke of Bridgewater, wouldn’t be opened for another three years. The ‘canal’ in Sowerby Bridge was not a canal at all, but the end of the Calder and Hebble Navigation, a system, of engineering works to make navigable the waterways running from the Pennines down to the ports of the east coast. Then in 1804 another canal arrived in Sowerby Bridge when the Rochdale Canal was cut through the Pennines creating a link to the textile towns of Lancashire and the ports of the Mersey. The problem was that the boats on the Rochdale Canal were too long to fit through the locks on the Calder and Hebble Navigation and the smaller boats from the east were too inefficient to take through the bigger locks on the Rochdale particularly given the problems of water supply. So Sowerby Bridge became the transhipment point between the canal systems from the two sides of the country as well as an important port for the surrounding textile towns. Just as Sowerby Bridge sits in a pivotal position of the UK’s canal network so it occupies a similarly important position in the history of the canals. It’s earliest warehouse – romantically called Warehouse 4 – dates from 1770 and is one of the earliest canal warehouses in the country. The adjacent Salt Warehouse was built in 1790s and on the slope above the basin is a complete set of buildings including the weighing house, the overseer’s house, stables and extraordinary mixed-use building with warehousing on the lower floors at the canal level, and a Methodist Sunday school above accessed from the high street. Such is the evident important of the complex that it comes as no surprise to see the wharf cherished and refurbished. However as with so many regeneration stories, what seems obvious in hindsight was anything but at the beginning. Even in 1996 after the battle of the car park had been won, and the campaign to reopen the Rochdale canal succeeded, regeneration was far from inevitable and there were still battles to be fought. One of these was to prevent apartments being built on the wharf, something that had been proposed in a masterplan prepared for British Waterways. Another was to persuade British Waterways that it didn’t need to achieve best value on the site but could weigh this against heritage issues. The wharf was already is a pretty poor state of repair when the waterways were nationalised in 1948 and it went down hill from there. In the 1970s British Waterways sold a lease on the site to a local person who gave undertakings to refurbish the complex, something that he was never able to do. At the time the people on the site were the Sea Scouts. The lessee let the buildings to three sub-lessees and when in the 1990s pressure from British Waterways caused the head lease be put on the market, it was the three tenants who were instrumental in bringing in the Prince’s Regeneration Trust and forming the Sowerby Bridge Wharf Partnership to spearhead the area’s regeneration. 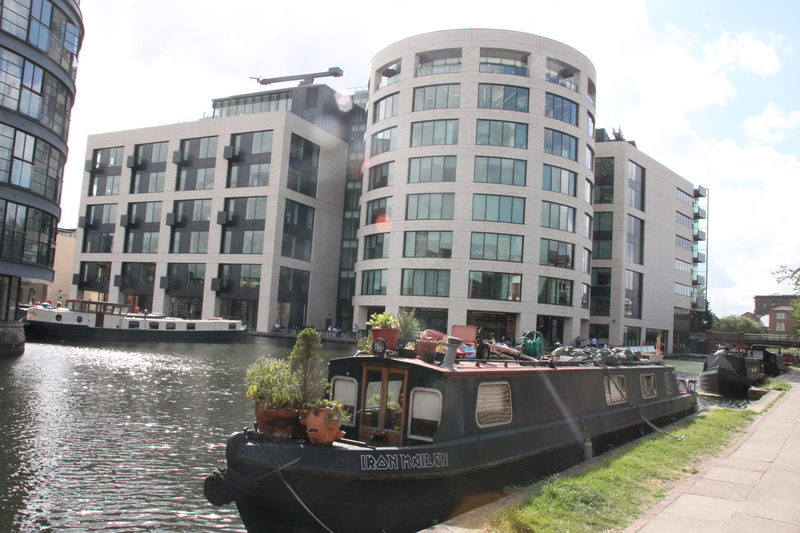 The problem was that British Waterways were insistent that they were required to make a commercial return on the buildings, which made it impossible for the partnership to put together a viable scheme. Representations were made to the Commons Select Committee on Environment and Transport who made a site visit led by their formidable Chair Gwyneth Dunwoody MP. The committee made it clear in no uncertain terms that the British Waterways position was wrong not correct, opening up the way for the partnership to buy out the head lease so that regeneration could proceed. By that time Warehouses 1 and 2 had already been refurbished by British Waterways but the Salt Warehouse and No. 4 Warehouse were in a very poor state. A cocktail of funding was put together by the partnership amounting to £2.7 Million including funding from Yorkshire Forward, the Council, English Heritage, Lottery and investment from British Waterways. Since that time the two vacant workspaces have been refurbished for business use. The road access to the wharf has been improved and widened and the gatehouse converted to a café with a new sculpture by Roger Burnett on the high street. On the hillsider the overseers house has been refurbished for a dental surgery with the stables below providing creative workspace. The wharf itself is busy with moorings and the comings and goings of Shire Cruisers who operate the boat yard and a leisure fleet from the basin. 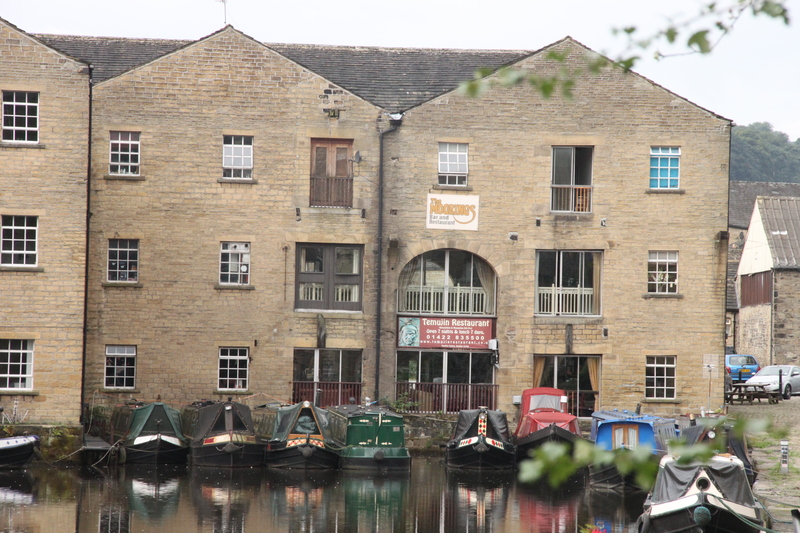 The wharf has become a lively part of Sowerby Bridge life. In addition to business space the warehouses include a number of pubs and restaurants, which have become part of the leisure circuit in the town. It is also provides the venue for the culmination of the Sowerby Bridge Rushbearing Festival which involves a maiden, a rush cart and a good deal of real ale. There were those on the academy visit who questioned why the wharf was not livelier, and wondered whether the partnership was right to be so against any housing development. It is true that the wharf is a real place of work so that the major apartment scheme proposed in the past would have been inappropriate. However it is not clear what harm that a greater mix of uses would do to the attractions of the wharf or to its existing occupiers. This may be slightly symptomatic of the drawbacks of a heritage led approach to regeneration that, for example, bemoans the replacement of timber piling on one of the warehouses from a heritage perspective despite this not being visible and worried about a contemporary lift shaft added to another building. From the perspective of an urbanist there would be value in encouraging some modest development to create a more clearly defined public realm and a greater intensity and variety of uses. Notwithstanding this, the achievement of Sowerby Bridge Wharf is impressive. It would be impressive in a large city, but to create a regeneration project of this size in a town of less than 10,000 people is remarkable. The Wharf is now home to 270 jobs and a range of start up and relocated businesses. It is testament to the determination of a group of people over many years who have created a special place and one that has transformed the town. Categories: Academy of Urbanism | Tags: Academy of Urbanism, Urban Design, Urbanism | Permalink. This piece was written as an assessment report for the Academy of Urbanism Awards in September 2012 and in November 2012 City Park won the Academy’s Great Place award. The city park in Bradford is an extraordinary place. The academy members who arrived for the assessment visit did so with no great expectations. Many places after all have installed water features in recent years and the technology is such that they are all very impressive. 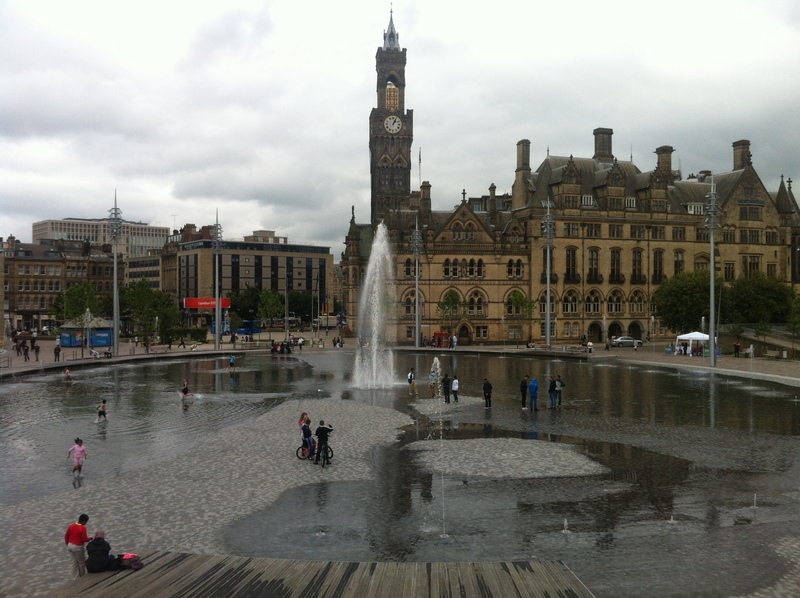 But Bradford City Park – or ‘Bradpool’ as local people have started to call it – is different. It is urban theatre on a grand scale and like the neighbouring Alhambra Theatre, the attraction is not so much the stage set, impressive as it is, but the actors. So successful has been the pool that Primark regularly sells out of socks and towels at the weekend. On the overcast Monday morning of the Academy visit it gradually filled with people as the pool filled with water over a five hour cycle. And these were all the people of Bradford, youths on bikes, elderly people, women in burkas, students, families – a happy, relaxed mix of people rarely seen in British cities (other perhaps than on a beach) and certainly not in Bradford. It’s a place that makes you think that Bradford is going to be OK and makes you believe that the physical environment of a place really can be transformative. Bradford is Britain’s great, lost provincial city. Bigger than Sheffield, Newcastle and Bristol and once richer than all of its peers, it has fallen on hard time in recent years. This is partly the result of bad luck, partly bad timing and, it must be admitted partly self-inflicted. Despite all of the money and effort expended on the city, most recently by the Urban Regeneration Company, precious little has been achieved even through the years of economic boom. With the worst possible timing, Westfield demolished part of the retail core, dug a big hole in the ground and were then forced to stop work on the new shopping centre as the credit crunch decimated the retail sector. Elsewhere flagship projects like the Chanel Urban Village were shelved while the redevelopment of the former Odeon became embroiled in a protracted campaign by heritage groups. This soured relationships so badly that there were even protesters at the opening of the City Park as the rest of the city celebrated. Meanwhile the jewel in the crown, the Mirror Pool – as City Park was originally called – failed to secure funding from the Big Lottery. To have built City Park in the face of all of this adversity is an act of sheer bloody-minded will power. It became an all or nothing issue, if Bradford could do this one thing then anything would become possible! The story starts in 2003 when the URC Commissioned Will Alsop to produce a masterplan for Bradford City Centre. The central idea of the masterplan was that Bradford no longer had sufficient demand to build on all of its vacant sites and so should turn them over to a linear park running through the city centre. At the heart of this new park stood City Hall in a natural bowl. The Alsop team suggested that this bowl be flooded to create a pool, which would wrap around the City Hall. The impact of the Alsop masterplan is still the subject of some debate. This was summed up by Daniel Cunningham wrote in Estates Gazette in 2005; ‘When Bradford’s urban regeneration company put Will Alsop’s masterplan on display at New York’s Museum of Modern Art in February, some back in Yorkshire thought a building full of whimsical works of imagination was the best place for it. Alsop’s vision for the former wool town, complete with a “business forest”, man-made lake and plenty of space to think and meet, left many local agents scratching their heads, even if it did grab the attention of Manhattan’s art lovers’. However the ambition and imagination of the plan, unconstrained as it was by practicality and economic viability, gave birth to an idea that, even in a much reduced state has an originality and power that shines through today (even if Alsop himself worries that the concept has been too compromised). The pool in the original plan would have required the demolition of the city’s main Police Station and Magistrates Court. As luck would have it the police were planning to reduce their presence on the site but there was no way that the court could be moved. The eventual design for the park therefore covered less than half of the area envisaged in the original plan. The process of transforming the original vision into today’s reality included a Neighbourhood Development Framework developed by ARUPs and eventually a design competition that was won by Gillespies. The plan was developed and became the subject to an application to the Big Lottery Fund. However conflict and debate continued to dog the proposals and when the planning application was submitted to committee it was very nearly refused (requiring the casting vote of the chair). Subsequent to this came the news that the Lottery funds had not been secured. It was that evening, in one of the function rooms of the Victoria Hotel that had been booked to celebrate the announcement of Lottery funding, that the council and Yorkshire Forward committed themselves, come-what-may to delivering the pool/park. It was about this time that a new broom started sweeping through the city, instigated through the appointment of Tony Reeves as the new Chief Executive and a new set of senior officers, including Barra MacRuarie as Strategic Director of Culture and Regeneration. As Barra told us during the academy visit, at his job interview he said that his aim would be to allow Bradford people to become tourists in their own city. To this end he committed himself to delivering City Park, setting aside two hours every Thursday Evening to meet with the project manager Shelagh O’Neill. As he told us, when you get to the end of a project the problems disappear, but problems there were throughout the development and construction of the scheme. The result might be expected to be a slightly compromised version of the original vision, as Will Alsop feared – but it isn’t, its brilliant! As Sheilagh told us, when the sun comes out, as it occasionally does in Bradford, something magic happens. And on que, just as the presentations to the Academy finished the sun came out and the atmosphere changed as the space filled with happy relaxed people. As we were told Bradford people are still learning how to use the space, exploring its possibilities and (there is no other word for it) playing. This is helped greatly by a hands-off style of management. Before it opened there was a great deal of debate about issues like alcohol, skateboards and bikes and anti-social behaviour. The brave decision was to say that the management would only intervene to prevent behaviour that risked damaging the space or harming its users. We watched kids circling in the water on BMX bikes and at lunch time people in the surrounding bars were drinking alcohol. The mix of people however means that no one group dominates the space and so far at least happy balance is being maintained. The next step is to programme the space. This started in spectacular fashion with the opening event that was reminiscent of the best days of the Bradford Festival. This September has hosted the World Curry Festival and there are developing plans for it to be programmed throughout the year. At present the budget and management capacity to do this is limited and the council are aware that they need to build activity up slowly. However it is a resource for Bradford that the city will learn how to use. The opening of City Park hopefully heralds a new confidence in the city. The successful completion of new offices for Provident Insurance on an adjacent site has secured 1,000 jobs in the city centre. Provident have made clear that they would have moved out of the centre had they not been convinced that the City Park would happen. The city has also won its bid to be UNESCO City of Film and is exploring the idea of a City Centre Growth Zone (as opposed to an enterprise zone) using rates relief to regenerate the city centre and… the next priority to kick start the Westfield scheme. City Park is therefore much more than another fancy city centre water feature it is potentially the point at which Bradford’s fortunes started to change.